SMD Transformer – Surface Mount Chip Transformer Guide. SMD Transformer is made from coils. There are a minimum of 2 coils in any SMD transformer. Learn more about SMD or Surface Mount Transformer. A SMD Transformer is made from coils. There are a minimum of 2 coils in any SMD transformer. One coil is called primary coil and the other is called secondary coil. These are used for coupling two sections. SMD transformers work at low distortion level but their working speed is very high. 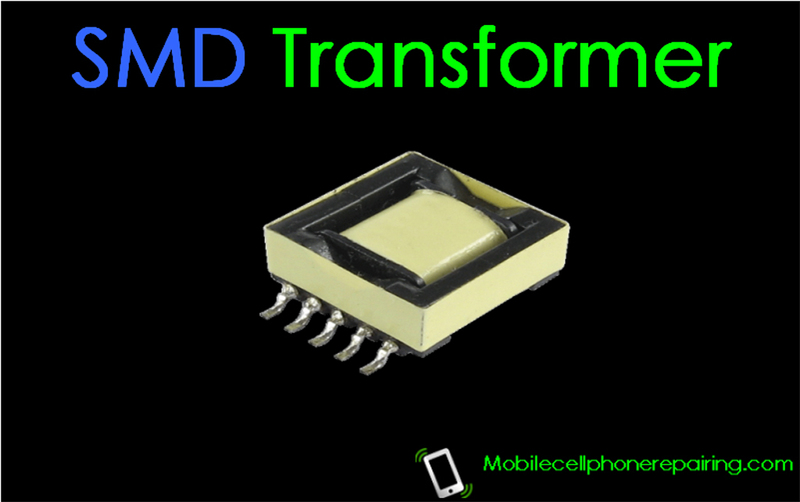 SMD transformer in a mobile cell phone is used in receiving and transmitting section of mobile phones. Transformers made of ferrite core are used in mobile cell phones. Ferrite is a synthetic ceramic matter which is Ferro magnetic. It produces a very high quality flux density. This is the reason why it can be used for high frequencies with minimum loss. Transformers made of ferrite core are very sensitive and scope of loss in minimum. A magnetic field is generated around the coil when current flows through a coil. When AC supply is given to a coil, the intensity of magnetic field keeps on varying between minimum to maximum because in AC positive and negative half cycle are produced alternately. If another coil is placed within the magnetic field of the first coil, voltage is generated in the second coil also. The component made on this principle is called transformer. Two coils are placed near each other where one coil in neutralized by placing the magnetic field of the other coil. Mostly both the coils are encircled one below the other. The conductor wires used in the coils are insulated with fine insulating material to prevent short circuit. What is the Graphical Symbol of Transformer? Which character or alphabet indicates a Transformer? What is the Work of a Transformer? The main function of a Transformer is increase or decrease AC voltage. What is the Unit of Transformer? The Unit of Transformer is Volt Ampere. When the voltage of the input of the secondary winding or coil is lower than the input given in the first winding, it is called step down transformer. When the voltage of the output of the secondary winding or coil is higher that the input given in the first winding, it is called step up transformer. Resistance should be checked when primary and secondary coils are checked separately. If only 1 is displayed, it means that the coil is OPEN. If beep sound or reading is received in one wire each of primary and secondary coil, it means the transformer is short.